I turned twenty-seven last week. I’m also single. Fans of Jane Austen will know that this puts me firmly in Charlotte Lucas territory. In Pride and Prejudice, Charlotte is the best friend of Elizabeth Bennet, our protagonist. Charlotte is described as around twenty-seven, plain, but sensible and practical. Charlotte is really more notable for what she isn’t; as Joshua Rothman writes, she’s not young, not pretty, and not rich. Not married. And at the age of twenty-seven, she’s a spinster. 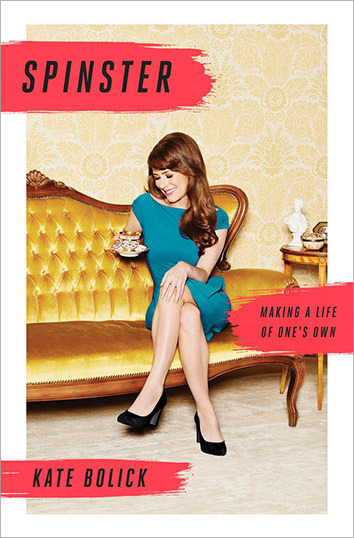 The cover of Bolick’s Spinster is a masterpiece of marketing. Try to count all the subliminal messages being sent here. Edwin Long’s The Spinster from Internet Archive/U of T Library. Source. Spinsters are pretty in right now. Lots of women (and men, too) are posting images of themselves with their cats to Instagram and silly Tweets about nightgowns and eating chocolate in bed (just a few examples from my own life…), using hashtags like #spinsterlife. The Toast, probably the Internet’s most popular blog for spinsters (which I say with admiration), has done a number of hilarious pieces about modern spinsters. Has spinsterhood become some kind of hipster lifestyle movement? Is it now about having cats and enjoying knitting and going on vacation alone? If so, I’m on board. We don’t need “spinster” as a legal categorization anymore (“single” or “unmarried” will do just fine, thanks), so let’s make it into a different thing, a fun, tongue-in-cheek kind of thing. Let’s all solve a murder and then go out for gin-based cocktails and head back to our perfectly decorated apartments-for-one like real badass spinsters. 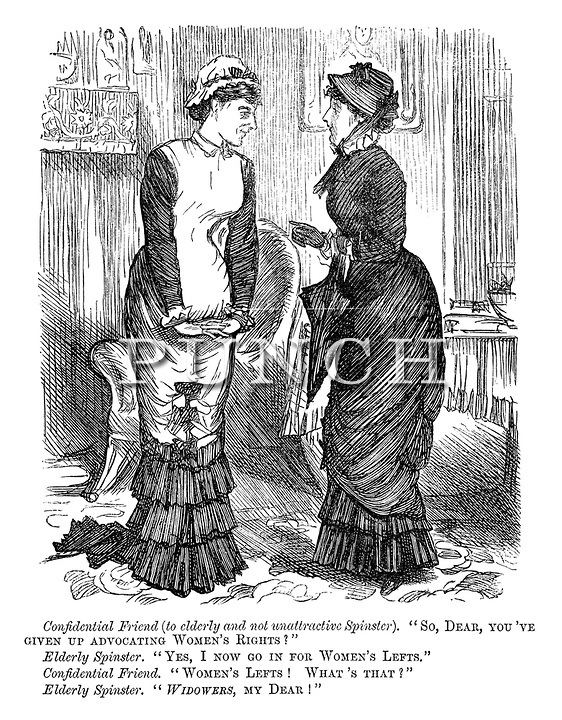 In real life (and some fiction), spinsters were objects of derision or pity. They began as independent women who spun fabric. And then, probably because unmarried women are threatening to a society that depends upon heterosexual marriage for reproduction, something changed and they became lonely figures. They weren’t cool aspirational figures who could do whatever they wanted; they were often women without family or money who couldn’t work because Sexism and so had to make ends meet with limited resources. As Briallen Hopper points out, for a book called Spinster, Bolick’s memoir/cultural history doesn’t have much to say about those kinds of spinsters. (In fact, it’s really not much of a cultural history at all, preoccupied as it is with white, relatively privileged New York writers. 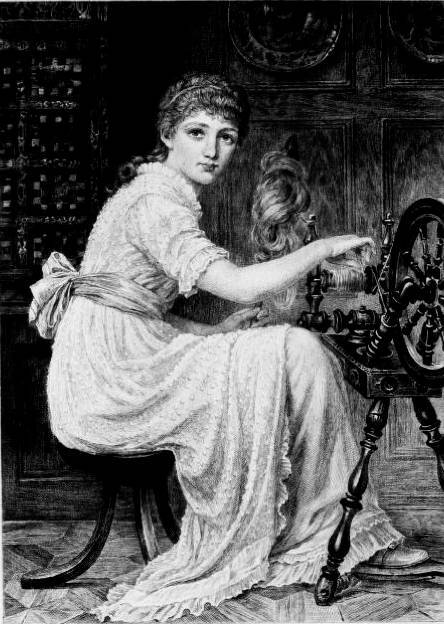 I’d love to read a book about the evolving figure of the spinster, from spinning fabric to today, if there are any out there.) Most of the five women Bolick profiles were married at least once. Bolick writes about the relationships she herself had in between bouts of living alone, travelling, and prioritizing her work. Bolick isn’t living a life apart from men; she’s constructing her life and fitting men in here and there when she wants to. An 1881 cartoon from the British humour mag Punch. Source. The “real” spinster is missing, or at least the spinster as we’re most familiar with her: the dour maiden aunt or neighbour with her pursed lips and reduced circumstances, hiding a secret life behind closed doors, the object of many speculations about why she never married—the Emily Dickinsons and Emily Griersons of this world (is Emily a spinster name or what? ), the Miss Havishams, the Miss Bateses, all of the many unmarried women in Henry James and Edith Wharton and Charlotte Bronte, even Miss Marple. Austen herself, and most of the Brontes, and lots of other female writers. These are women who are uninteresting to men for reasons of looks, money, or personality (too outspoken, too awkward, not agreeable enough) or threatening to men because of their intelligence and desire for something other than marriage in a time when marriage was the only acceptable end to their stories. The Charlotte Lucases of fiction. Charlotte, of course, becomes not-a-spinster pretty quickly; she marries Elizabeth’s cousin Mr. Collins, who had previously proposed to Elizabeth and been rejected. Mr. Collins is odious—all you need to do is search for images of “Mr. 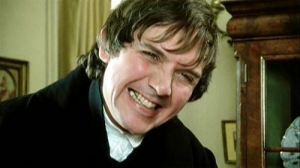 Collins Pride and Prejudice BBC” and you’ll see exactly why Elizabeth, or anyone, would have refused him. He’s a pompous, self-important social climber. He simpers in front of his social superiors and self-righteously informs his cousins of what books they should be reading. He’s horrible. So why does Charlotte marry him? Because he has a wealthy patron and a good income and he’s going to inherit the Bennet house some day. Charlotte’s twenty-seven and this might be the first and last marriage proposal she receives. As Mrs. Collins, she’ll have a house of her own, probably children, and security for the rest of her life. As Miss Lucas, unmarried eldest daughter of a small-town knight, she’ll be a burden to her parents. Mr. Collins isn’t exactly tall, dark, and handsome. Source. Rothman argues that we should try harder to understand Charlotte’s choice to marry Mr. Collins, a choice that is generally read as depressing or sad, even in the context of Charlotte’s world, Regency-era England. Especially as modern readers, we’re sad that Charlotte feels that her only option in life is to marry a man she doesn’t love. She’s the 1813 version of that Princeton mom. As Rothman points out, though, this is a choice that Charlotte makes herself, in a world that tries its hardest to deny her a choice at every turn. She’s fully aware of Mr. Collins’s defects, and her own. She isn’t pretty enough or rich enough to attract a different kind of husband, and that’s her reality. So she makes the choice to marry him, to be a wife and not a spinster, to create a life of her own (she rearranges the rooms in his house to her liking and encourages him to spend his time in the garden). Not the kind of life that Bolick decides to create, but a life that she can live with nonetheless. I started with Spinster, but I’ve found myself reading a lot of books about these topics: dating and relationships, being single, modern love. Maybe that’s the cultural moment we’re in now. People are delaying marriage, and online dating is taking off, so people are writing about these things. There’s Spinster and a number of smart reaction pieces to it. Aziz Ansari’s book on the sociology of modern dating, Modern Romance, came out this year, following a 2014 book called It’s Not You: 27 (Wrong) Reasons You’re Single by Sara Eckel (there’s that number again). All of these articles and books have made me think a little harder about how we date, and why. Ansari writes well about the problem of dating in the modern age. 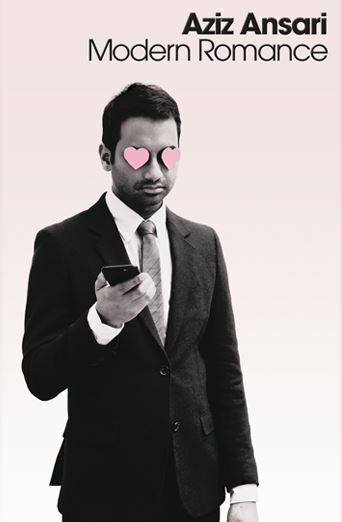 Modern Romance is immensely entertaining, and reassuring, too, if you’ve ever tried online dating and thought, “Well, this is terrible.” You’re not alone, because Ansari has tried it, too, and he has a lot of funny anecdotes to share. He retells dating horror stories people told him in focus groups. He visits retirement homes to figure out how people met fifty years ago. He travels to Tokyo and Buenos Aires to see how people date in other countries. Unlike Bolick, who writes to defend the spinster life, Ansari assumes that if you’re reading his book, you’re interested in dating and settling into a serious relationship (and Modern Romance is about men and women). So he has a few practical tips about giving it more than one date, and actually meeting up in person instead of living through your screens, and so on. But he also makes a number of accurate observations about the state of modern romance. Dating is hard. We’re all on our phones all the time, and another potential date is just a swipe away. We can’t focus on the person sitting across the table from us. Eckel, too, writes about how hard dating can be. In her late thirties, Eckel was single, not by choice, and found herself frustrated by all of the well-meaning advice she received from friends. So she wrote an essay and then a book to explain why it was all wrong. You’re too picky, you’re too confident: it may be well-meaning, but it’s all contradictory. It isn’t “too picky” to reject people who want different things than you do, it’s smart. How can being “too confident” scare suitors away when people are also telling singles they should be more confident to attract others? Eckel’s argument is that most single people (those who don’t want to be single) simply haven’t met the right person yet. It’s Not You is about how it’s fine to want to be in a relationship, and Spinster is all about how it’s fine to not be in one, but they have much in common. You have to create your own life, whether you’re in a relationship or not. And you should think about the choices you make: the bad relationships you leave; the people you choose not to date or the ones you waste time with, knowing that you don’t even like them; the marriage proposal you may have turned down; the person who treated you badly and you couldn’t see it. Why did you make those choices, and what do they say about what you really want? I’ve been jokingly referring to this as my Charlotte Lucas Year. Celebrating my birthday with a friend, I drank a cocktail called an Old Maid, a delicious sort of alcoholic lemonade, and I thought about all the things I have at twenty-seven that many spinsters before me could not. It’s 2015, and so I can date whomever I choose. More importantly, I have a job that I find fulfilling and a small amount of disposable income to spend on spinster-y things like my cat and adult colouring books and a library card catalogue. And then, I can post photos of all of those things to Instagram with a sarcastic hashtag. In my own way, I’m participating in the spinster reclaiming, celebrating elements of “spinster culture” and self-deprecatingly talking about being an old maid at twenty-seven, knowing full well that I’m not. I don’t know what Charlotte Lucas Year actually means just yet—maybe it’s just funny, or maybe it means I’m going to spend this year trying to figure out my life and what I want from it (spoiler alert: not to marry Mr. Collins). I think, though, that single or coupled, as we get older, all of us are setting off into uncharted territory. Our lives don’t look much like the lives of our parents; we’re delaying marriage and babies, not buying houses, driving Zipcars and taking transit and living in cities instead of moving to suburbs. Like Charlotte, we all have to figure out what choice is right for us, regardless of what judgmental readers have to say about it 200 years later.